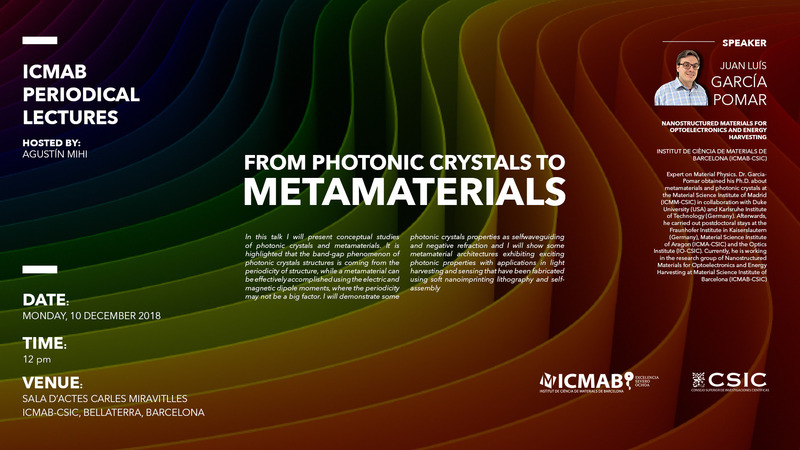 In this talk I will present conceptual studies of photonic crystals and metamaterials. It is highlighted that the band-gap phenomenon of photonic crystals structures is coming from the periodicity of structure, while a metamaterial can be effectively accomplished using the electric and magnetic dipole moments, where the periodicity may not be a big factor. I will demonstrate some photonic crystals properties as selfwaveguiding and negative refraction and I will show some metamaterial architectures exhibiting exciting photonic properties with applications in light harvesting and sensing that have been fabricated using soft nanoimprinting lithography and self-assembly. Expert on Material Physics. Dr. Garcia-Pomar obtained his Ph.D. about metamaterials and photonic crystals at the Material Science Institute of Madrid (ICMM-CSIC) in collaboration with Duke University (USA) and Karlsruhe Institute of Technology (Germany). Afterwards, he carried out postdoctoral stays at the Fraunhofer Institute in Kaiserslautern (Germany), Material Science Institute of Aragon (ICMA-CSIC) and the Optics Institute (IO-CSIC). Currently, he is working in the research group of Nanostructured Materials for Optoelectronics and Energy Harvesting at Material Science Institute of Barcelona (ICMAB-CSIC).